Do you want the best Gemini Incense? You found it! We know you want an incense that fits you! Enjoying incense speaks to your curiosity and versatility. The sign of Gemini means you were born between May21st and June 20th under the sign of the Twins, a perfect sign for a Gemini signifying the two sides of the Gemini personality. You juggle many things at once, you need twins! With the of element of Air, you are smart and curious, you are known to be fair and balanced in your communications and relationships. Your qualities include being quick-witted and playful. Sometimes your dry sense of humor is misunderstood. Traits of a Gemini person include; Being versatile, you are able to multi-task and get things done. You are witty and intellectual, often winning Trivial Pursuit and other games, you like to win! Because you dislike boredom, keep yourself stimulated it’s not hard for you because you are also curious and outgoing. You are most compatible with Aries, Leo, Libra and Aquarius. You are ruled by the planet Mercury, the planet of communication dominance. You learned to talk about what you are thinking and feeling. You are also ruled by your arms, lungs, hands and nervous system. You may tend to worry a lot, especially when not keeping busy. 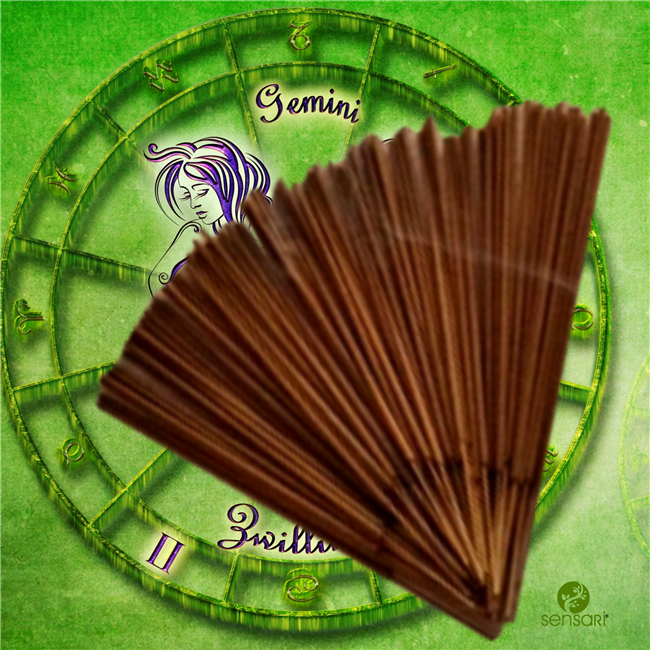 Your specific Gemini incense scent is a blend of eucalyptus and mountain air. A beautiful blend! Gemini’s love to take a deep breath of fresh clean air and this combination is perfect for you! This aroma is good for use anytime: day or night, work or play! You are versatile! Being able to see both sides of a situation allows you to understand people better and be a great consultant and . Enjoy your time with Gemini incense, supporting the real you! Other people under the sign of Gemini include: Marilyn Monroe, Kanye West, Angelina Jolie and Clint Eastwood.